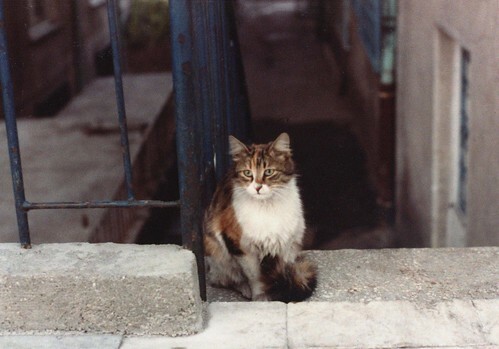 Since I was turning my personal Tumblr account into a girls & cats Tumblr anyhow, I created dreamcats, a repository of pictures of cats on film, soft focus cats, girls with cats, etc. I'm sure something like this already exists, but something like this as "curated" by me did not exist until now. Feel free to send along your favourite dreamcats, catfriends! And if you have cat allergies but love cats, you can follow dreamcats and not have to reach for tissues. Tess (it's her birthday today!) and Kater and I have started a cat club. We have secret rings and everything. Yeah, that's right. And this post of Carly's made my day. Man, I love cats! erin / atlantictreefox: I'm glad you liked that line. I have no idea what it means, and I almost deleted it! People never laugh at my jokes! danielle and dinosaur toes: Thank you! Oh, I doubt you will be. You have fine taste. alice: Thank you! And I hope you enjoy your Gentlewoman! SJ: Aw, I'm sorry! I'm glad you like it, though. jen: Thank you! So nice to have some backup. shin ae: Aw, you're sweet. Haha! I always wonder if people actually bother to read my crazy Twitter updates! erica-knits: I think it will be my summer dress of 2010. Tavi called it a "Miu Miu knockoff fail" but hey, I'm not getting samples from Prada any time soon. Definitely try to get a copy -- it's so good. Like Lula all grown up, less dreamy. Jane Flanagan: Sometimes I have issues with Zara buttons falling off and such, but generally it's not too bad. Thank you! That is a huge compliment! nole: Good luck with the hunt -- I hope it ends in dress satisfaction. May: Oh yes, the paper they used is fantastic. Such a satisfying texture, and I love the pliability of it. I guess that might sound weird, but good paper makes a huge difference. I'm glad you like the dress! teacup adventure: An excellent equation! Jennifer: Thank you! Yes, I definitely agree. I recently read about another blogger, who is my age, getting comments about her dressing too young for her age, but that thought had never occurred to me. It was sad, actually. eri: Thank you! I hope you found it. I suppose that dressing actually takes work. I'm sure we've all seen the result of not thinking about it! And that includes learning about what can be age appropriate. roberta jane: Aw, I'm sorry! sweetie pie press: Not at all! I wanted to go, and had every intention of going to the trunk show, but I really was not well that day. I didn't leave the house at all. Hello Lindello: I hope so too! It's pretty amazing. Melissa: Oh, thank you -- I do take that as a compliment. I probably look my age in real life, but yeah, I agree that it's often hard to tell. jaime: Thank you! Oh, that would be lovely. I myself would love to visit the Cloisters one day. Miss Cris: Thank you so much! jessica: Thank you! And yes, I agree. nice-etc.com / caitlin: Haw haw! Yeah, thanks! Thanks for your input on Twitter, too. alice: That seems to be the consensus, which makes me happy. TEXTSTYLES: Seriously! So good. Kind of a bummer that it's only biannual, but maybe they'll be extra good issues. I'm glad you like the Hoof too! Amazing. Natasha: Oh yes, I love it too. m.bardeaux: Thank you! And of course, I love Cat Party! miss sophie: Thank you! I agree, the colour is great. raquel raney: Yes! So dreamy. i really think you and karen should curate a cat themed trunk show while i am away (not that i wouldn't want to be there). i wonder if there would be an interest. it would be weird but wonderful. yes yes, oh yes. this will be my new fave tumblr site, for sure! I didn't think you could get more awesome. I agree with Sweetie Pie Press. A cat themed trunk show would be epic! I would buy the place out! You guys should totally do it. I think Magic Pony had a cat themed show a while back, but they are a bit out of my price range. I am definitely a lover of kitties though (I actually have three). I have been reading your blog for a while now, but did not realise you had a Tumblr! People are so stealth with those things. I just got one recently, and you are totally followed. I can't wait to get knitting again. I miss it! I am so glad we have a cat club. There are so many people who love cats with unending hearts, it makes me feel so nice! Amazing!! I love these pictures! And kitties! And oh! Just wow. I've been missing my kittehs a lot whilst I've been at university. oh my gosh... you are killing me. i think i need to get a cat of my own right now. i haven't had my own since i was a kid...it's been way too long! Ah! This is so great! I feel warm and fuzzy already. though my favorite type of cat is a tuxedo one. This is a wonderful idea! Cats, from my personal experience, can seem almost human-like at times, which makes them such an interesting subject for photographs. Not to mention, the perfect companion! Oh my goodness, that one second from the top is so teeth gritting-ly cute and fluffy! 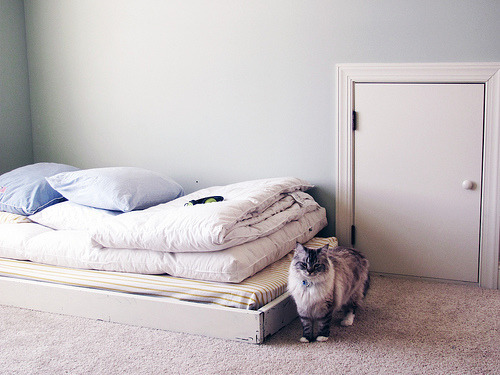 I also love that a couple have little cat sized doors, this is going to be so good! Did you see yesterday's Flickr Blog Post? Also, Charlyn's cat (Fig Newton) is kind of the cat of my dreams. Oh oh! I completely forgot to buy the ring. I must go do that now. I hope it's still there! I think Becky's idea is good, BUT since Karyn is a dog lover, shouldn't it be a cats & dogs trunk show? Maybe it could be called "it's raining cats & dogs" since that would be appropriately cheesy... I would love to participate in that. 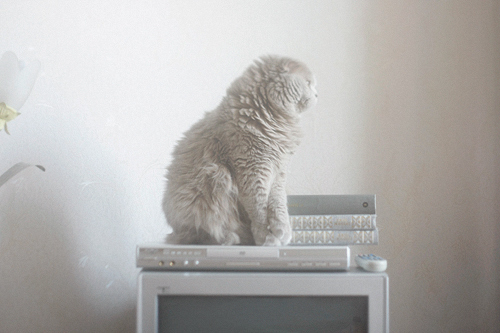 i have a tumblr all about my cat, Breakfast. It's all notes that I write to her about how much i love her or about her being ridiculous. Maybe you would like it. awh those are such lovely lovely photos!!!! so many come to mind i am worried how much surfing i will do to find them again. you are such a girl Anabela! i mean that in the nicest way of course. does sweetie pie press mean you should travel around with a trunk full of kittens!? i like this idea. I like kitties, but I am very allergic to them. Also, I fear that they do not like me so much. I think it's all the squealing when I see them. I am really, really enjoying this cat thing you are having, though. i really need someone to do this for doggies. fluffy doggies. i would stare at it all day. I love that first photo, it's just so sweet! ANABELA! I just found a super awesome source for some dreamcat photos...this blog has some pretty awesome photos in general, and if you look under the animal category (but a few pages into it), there are some pretty sweet cat photos!